Ureteroscopy is a surgical procedure that employs a small, flexible instrument called an ureteroscope to inspect and treat issues inside the kidneys and urinary tract. During a ureteroscopy, the ureteroscope – similar to a laparoscope – uses fibre-optic technology to provide video imagery to the urologist. It also has small channels for operating. 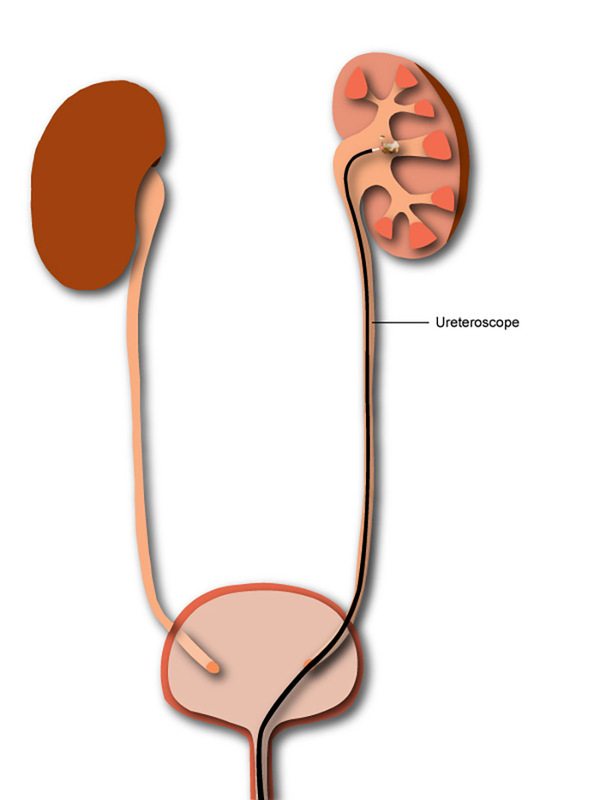 Ureterosccopy is most often used to treat kidney stones or ureteric stones. It also may be used to inspect and treat cysts, tumours or abnormal tissue in the bladder, ureter or on the lining of the kidney. There is always a risk of infection with ureteroscopy so it is imperative that all patients have a urine test a week before elective ureteroscopy. Kidney (or ureteral) stones may be removed using forceps or a “basket” that is attached to the channels on the ureteroscope. Smaller stones can be removed in one piece, but larger ones may need to be broken down into smaller pieces before they can be taken out. Dr Arianayagam routinely uses a laser to break stones. Some stones are fragmented into dust while others are broken into pieces and then removed with a basket. If the ureteroscopy is to inspect the kidneys or ureter, the whole procedure may only take 15-30 minutes. For the removal of stones it may take longer, depending on the size of the them. Typical operative time for stones is around an hour. Ureteroscopy is an outpatient surgery, meaning that it doesn’t require an overnight stay in hospital. You will need to stay in recovery and day surgery for a few hours prior to discharge. This is to ensure you have recovered fully from the anaesthetic. Patients also need to drink plenty of water after the procedure. Blood in the urine is common as well as pain on the side operated on. You will be given pain relief to go home with. Burning or stinging while urinating can be reduced by drinking Ural. Patients can usually go back to work after a few days if they are feeling up to it. A week of rest may be recommended depending on the surgery. It usually takes around two weeks for the side effects of the surgery to disappear. A stent is usually left in place; ensure that arrangements have been made for stent removal before discharge. Stents may cause frequency or urgency (extra trips to the toilet to urinate) as they can irritate the bladder. As with any kind of surgery there are risks involved with ureteroscopy including bleeding and urinary tract infection so it is imperative that all patients have a urine test a week before elective ureteroscopy. There is also the risk of developing some mild abdominal pain and the inability to urinate due to swelling of surrounding tissue. Common side effects from the procedure include a mild burning sensation when urinating and small amounts of blood in the urine. Patients may also feel the need to urinate more often than usual. While he is primarily a urological cancer surgeon, Dr Arianayagam also sees patients with more general urological problems. Dr Arianayagam performs several ureteroscopies each month. If you have any further questions about ureteroscopy or would like to book an appointment with a urologist in Sydney, please feel free to call.